This Hinkley Cello 2 light antique bronze finish semi flush ceiling light with alabaster glass is classically inspired, supplied by Elstead Lighting and designed by Hinkley. Semi flush fixtures are best suited for ceilings that although not particularly low, do not have the height to comfortably fit a chained fixture. Lighting and styles are all a very personal choice, not only do you have to choose a style that will compliment your traditional decor but also thought has to be given to not only ceiling height, but also the height of those within your family. The Cello semi flush fitting is finished in antique bronze and holds a vintage style faux alabaster glass up-lighter within two elegantly scrolled arms and circular rim. From ceiling plate to the bottom of the end finial the fixture has a height of 41cm. 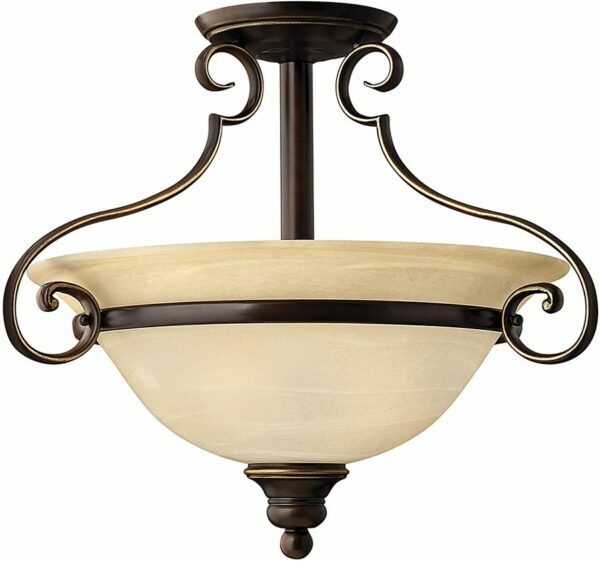 Supplied by Elstead Lighting and designed in the USA by Hinkley Lighting, founded in 1922 in Cleveland, Ohio. Their long heritage combines with a pursuit of innovative design to create modern and contemporary lighting to create stunning designs like the Cello 2 light antique bronze finish semi flush ceiling light with alabaster glass you see here.